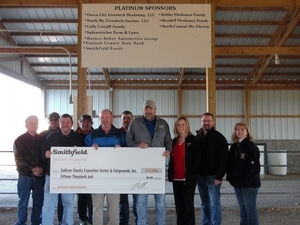 Smithfield Foods donated $15,000 to the Sullivan County Exposition Center & Fairgrounds for the construction of an outdoor amphitheater overlooking Lake Cowgill. SMITHFIELD, Va., Dec. 13 /CSRwire/ - Smithfield Foods, Inc. is pleased to announce a $15,000 donation to the Sullivan County Exposition Center & Fairgrounds to support the construction of an outdoor amphitheater overlooking Lake Cowgill that will be utilized for events throughout the year. The Sullivan County Exposition Center & Fairgrounds, Inc. is a nonprofit organization that hosts community events throughout the year. The current facility features a rodeo performance area, a tractor pulling track, a demolition derby or mud run arena, and a livestock barn and show arena. With the help of Smithfield’s gift, the organization will add an amphitheater as well as a youth campground and permanent shower and restroom facilities. Future plans also include the development of a multipurpose 400-seat exposition center. Smithfield’s support of the Sullivan County Exposition Center & Fairgrounds aligns with its commitment to contribute to the vitality of the communities where its employees live and work. Smithfield’s Milan, Missouri, facility was established in 1994 and employs nearly 1,200 local employees. For more information about Smithfield’s commitment to its local communities, please visit smithfieldfoods.com/helpingcommunities.